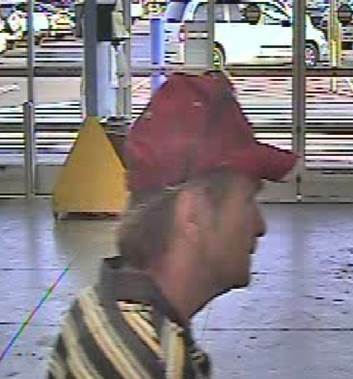 On April 26, 2016 at approximately 7:30 PM, a white male suspect stole a 1994 Buick Regal sedan from the parking lot of Wal-Mart, located at 2500 West Stone Drive in Kingsport. The owner of the vehicle had left the vehicle unlocked with the key in the ignition for approximately 10 minutes while he went inside the store. A Wal-Mart employee saw the suspect initially look inside the vehicle and spot the key in the ignition, then immediately open the door, get in, and drive away. The following evening, at approximately 11:15 PM, a Kingsport Police Patrol Officer spotted the vehicle parked in a driveway in the 1200 block of Fairview Avenue. The officer circled the block, but when he returned, he observed the vehicle being driven at a high rate of speed northbound on Fairview Avenue. The vehicle was soon recovered after being found abandoned with a flat tire four blocks away behind the Midfield Market, located at 1600 Fairview Avenue. At the time of recovery, the stolen vehicle contained a lawnmower, two leaf blowers, and two portable CD players that were not in it when it was stolen and did not belong to the vehicle owner. Presently, they are believed to most likely be stolen as well. Anyone who recognizes the suspect in the included photograph and video link is asked to contact Detectives in the K.P.D. Criminal Investigations Division at 423-229-9429 or call Kingsport Central Dispatch at 423-246-9111. The Kingsport Police Department strongly discourages the practice of leaving a vehicle unlocked and/or leaving the key in the ignition. It unnecessarily allows unauthorized people, both criminals and inquisitive minors, access to both your vehicle and its contents. Removing the key and locking the doors is a very simple safety and crime prevention step that in reality should be second nature for everyone.